In the great game of marketing, we often talk about “funnel this” and “funnel that”. But how often do we look at a real funnel to figure out what’s working and what’s not? Well, we’re doing just that — with the Property2020 lead gen funnel I stumbled across while dreaming of houses. This funnel aims to generate B2C leads for an upcoming property seminar, but the same things that work (and don’t work) for this funnel are largely universal. Here’s where it starts. Unlike a few other Google Ads around property investment seminars, it’s a simple ad, shunning the use of sitelinks or callouts to amp it up. I found the description quite powerful: “Discover how to set yourself up for life with real estate”. It’s a big, bold claim. Naturally, I was curious to see if the page behind this ad could deliver on the promise. The headline is factual and doesn’t carry any emotion or impact, simply describing the offering, that’s it free and that it goes for the one day. Getting prospects interested in property investment into an environment where courses and other materials can be pitched. (It explicitly talks about offers being available at the event in the FAQ). The funnel components that come after signing up for the seminar are akin to the cherry on an ice cream sundae: a nice flourish, but no substitute for the sundae itself. Despite the slightly weak headline, the writer hedged his bet and added the “set yourself up for life” line from the Google ad as a subhead (incidentally, a good example of message matching). The bullets throughout are generally colourful, curiosity-building and speak to strong benefits that revolve around the big idea (i.e. making a fortune in property). 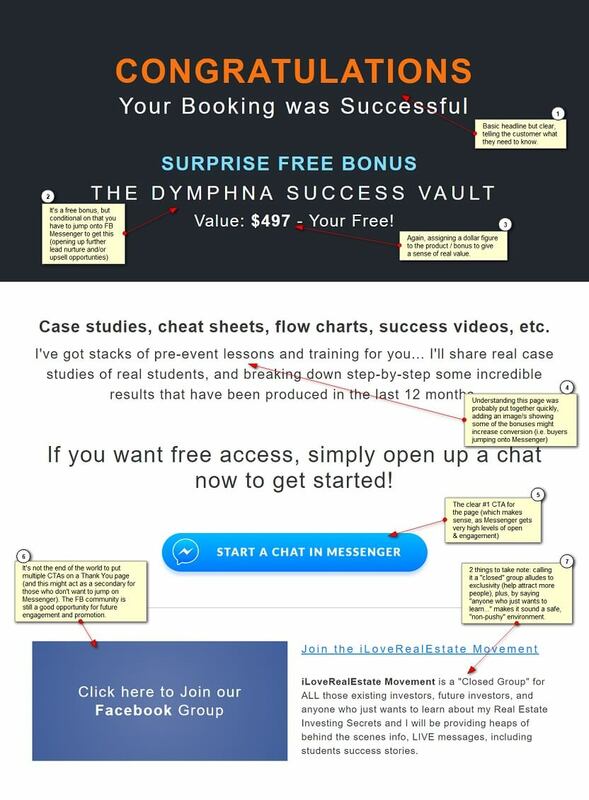 From the literal Proof pop-ups that show who’s just grabbed a ticket, the dozen odd video testimonials, and the big dollar figures thrown around liberally, this page uses a lot of proof to back up claims and build credibility. The fact that half the page focuses on the speakers’ stories is as much about credibility-building as it is selling the seminar. In terms of language, the button copy “Register for Free Seat Now” / “Secure My Free Seat Now” is nice and clear, prompting readers to make that (cost-free, risk-reduced) next step. 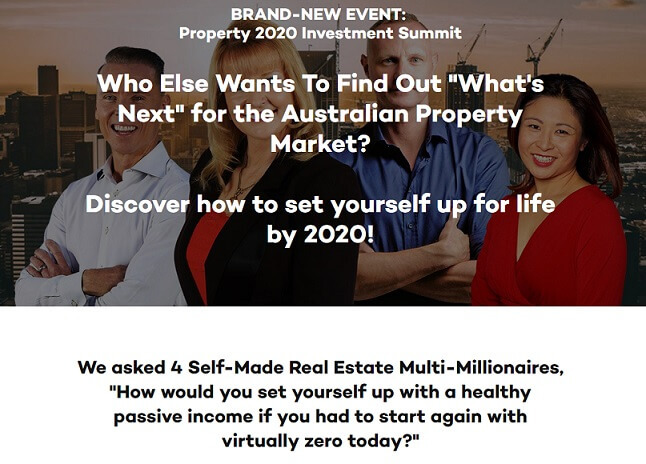 Despite the “what’s next” headline, the page’s big idea is all about making a killing in property, though the presentation isn’t particularly original (you might argue it doesn’t have to be). An old headline formula that pops up quite a bit. It’s interesting they led with a “weaker” benefit: finding what’s next for property is nowhere near as strong as making big money from it (admittedly, the “make money from property” angle is quite the cliché these days). The lead feels a little disconnected from the headline. It immediately goes into talking about the experts and how they’d “start again” with property, which while relevant to the offer, doesn’t flow from the hero. More often than not, confirmation emails tend to be “just the facts, ma’am”. It’s a missed opportunity to get your prospects excited. However, the registration email takes full advantage of that opportunity. Before giving you the event details, it launches into “picture” copy, painting the dreams of property cash flow or not having to work. It effectively sells the seminar again, reinforcing the sales page messaging and increasing the chance of the reader attending. After giving you date, time and venue details, it repeats the VIP offer that’s on the upsell page (which we’ll get to in a minute). This gives them a “second bite” at anyone who bailed from the page after the initial seminar sign up and didn’t accept the upsells. The email encourages attendees to invite a friend. This kind of social promotion is useful as the person “selling” it to their friends or partners is personally invested, they’re more persuasive than any sales page could be and they’re likely to know other people who share similar interests (in this case, property). Not much: this email’s far superior to a lot of confirmation emails you’ll see in your inbox. 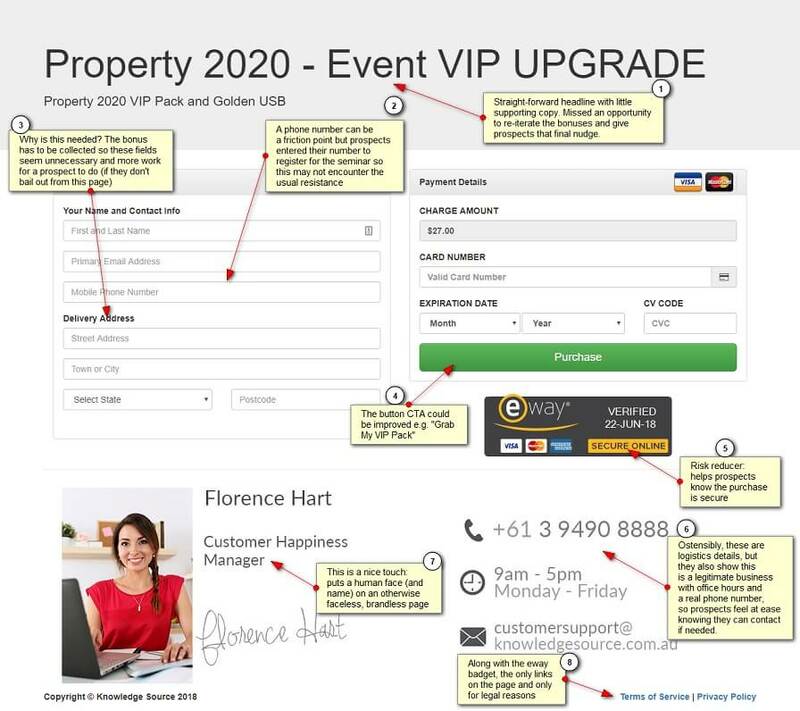 Like any upsell page, Property2020’s version has one purpose: to sell attendees a “tripwire” product and make them a paying customer. As Digital Marketer points out, changing the relationship dynamic from raw lead to existing customer can work wonders when it comes to selling your higher value items, which happens to be the aim of the seminar. There’s a small note at the bottom stating attendees must collect their bonus at the Summit. This forces those buyers into attending (as they now have a financial interest) and they do as existing customers, which strengthens the relationship. The page could have been a little more polished in terms of design and presentation. Those who decide not to buy the upsell? The funnel fun isn’t over just yet. Not everyone who signs up for a free webinar wants to spend $27 on an upsell. But how about a measly $7? A great example of a downsell, which still serves a similar purpose to the original tripwire (building the “customer effect”). 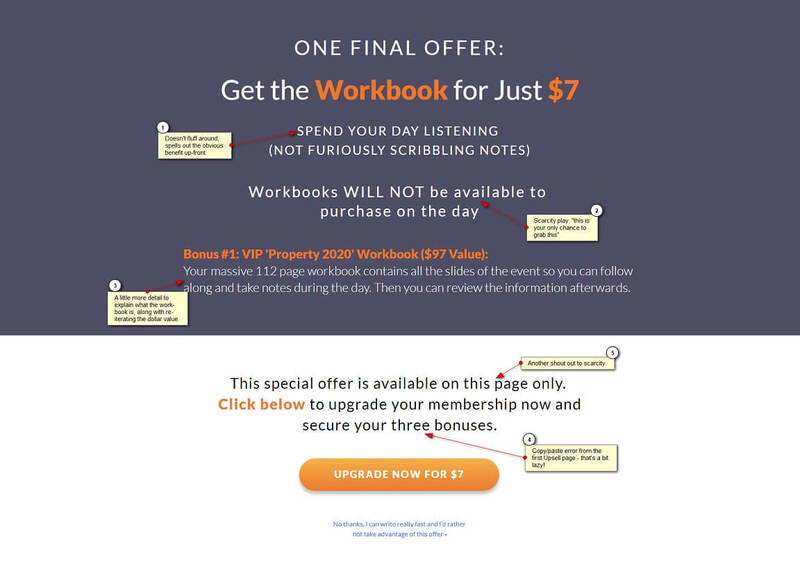 The downsell uses “scarcity” by spelling out the Workbook won’t be available at the seminar. Like the other upsell page, this one lacks a little in presentation. The writer could have strengthened the “scarcity” message by adding a reason why the Workbook won’t be available to buy on the day. You can still lose your prospect before money changes hands, so it’s important to make the purchase process as quick and easy as possible. The proof elements: with the eway “verified” badge, the contact details and the Customer Happiness Manager photo, this page does a good job of reassuring visitors they’re buying from a real business, which can be a big deal online. The upsell (whichever was chosen) with supporting “value-driven” copy could have been displayed on the page to reinforce what the attendee was about to buy. The inclusion of the “Delivery Address” fields seem unnecessary (as the upsells aren’t sent out) and means extra work for the buyers. It also seems a little misleading to label them “Delivery Address” fields when nothing is delivered — something that buyers on the ball might pick up. Success! By now, a prospect has found the ad, signed up for the Summit and grabbed a “golden USB” or Workbook. That’s pretty much it until the day of the event, right? Not quite. The Thank you page is one final chance to engage prospects and upsell them before they finish up. This thank you page gives attendees even more opportunity to engage and build the relationship prior to the event. The Facebook group is a good secondary, “safer” option to offer attendees, keeping the brand, event and topic front-of-mind until the Summit and providing another way to build relationships. Like the upsell pages, the thank you page feels a little rushed in its design. The prospects have signed up and bought (or ignored) the upsell. They might have jumped onto Messenger or joined the Facebook Group. The next step is the funnel’s culmination: the Summit and presentation of bigger ticket, core offerings. But the funnel doesn’t end there. On signing up to attend the seminar, you’re added to Knowledge Source’s email list and start to get their regular missives and promotions (I didn’t see that mentioned anywhere, but I may have missed it). In fact, this might just the beginning of many more funnels. Naturally, there are a thousand ways to build a funnel. The Property2020 funnel is just one of those, with its share of strong points and weaknesses. Have you taken a closer look at your funnel lately? Disclaimer: I have no commercial interest in the product and the analysis is purely my own thoughts and opinions.